Every year NMITD organizes many sports and cultural inter-collegiate competitions as part of its mega annual social festival titled “Roobaroo”. The activities are based around a core theme.The theme is based on current issues which is selected by Roobaroo core committee and faculty members. Various inter-college sports competitions are conducted which included outdoor as well as indoor games.In addition to this many innovative cultural and creative activities are organised. RooBaRoo concluded with “Annual Day” and “Convocation Ceremony”. Where “Annual Day” was well chalked out with various performances of students like solo-singing, group-singing, solo-dancing, group-dancing, etc. In the “Convocation Ceremony” the graduating batch of MCA and MMS were awarded their degree convocation certificates and also felicitated with a special NMITD graduation memento frames in the presence of dignitaries. 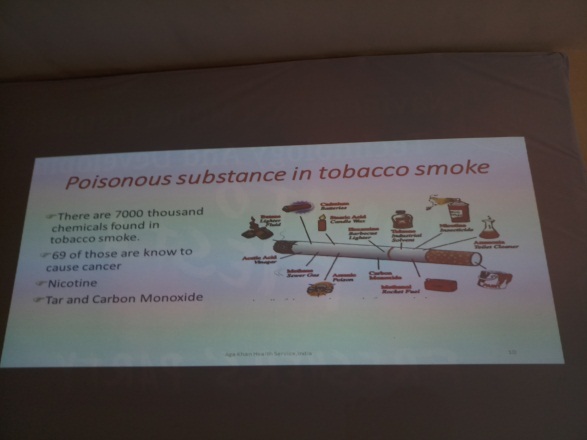 An enlightening session on variety of issues related to tobacco was conducted at NMITD by Dr Prasad Rane from Aga Khan Health Services India on 20th October 2018. 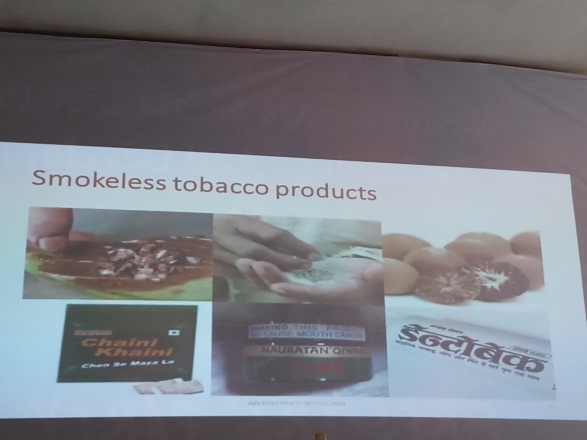 Dr Rane gave the students of NMITD, a 360 degree comprehensive understanding of all aspects related to Tobacco in India, right from their production, distribution, advertising, variety of tobacco products, the business models and vested interests involved, the existing laws for curbing the addiction to the serious health hazards –all mental/physical as well as socio-economical – as a consequence of Tobacco related addiction. There were students of both MCA and MMS Present for the session. “Tobacco is a product prepared from the leaves of the tobacco plant by curing them. The plant is part of the genus Nicotiana and of the Solanaceae (nightshade) family. While more than 70 species of tobacco are known, the chief commercial crop is N. tabacum. The more potent variant N. rustica is also used around the world. Tobacco use is a risk factor for many diseases, especially those affecting the heart, liver, and lungs, as well as many cancers. Deep Breath: Getting oxygen to the brain helps release de-stressing hormones. 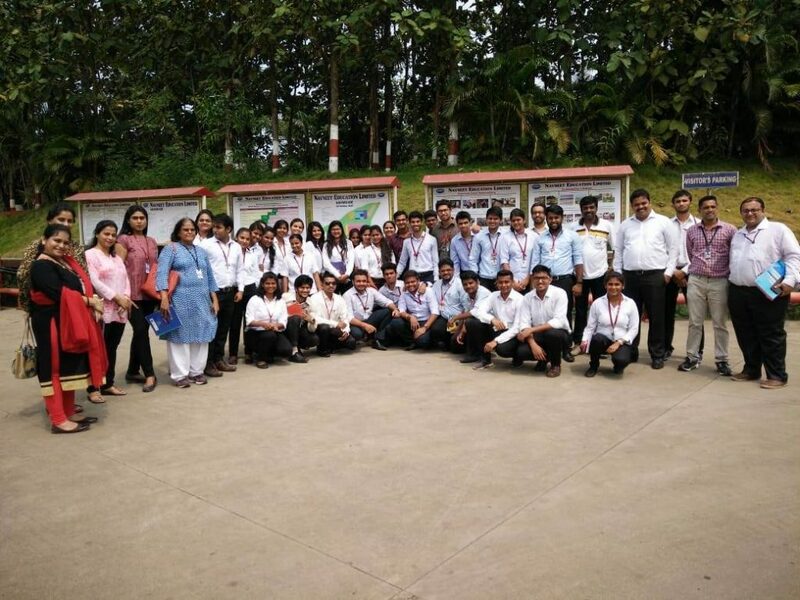 Putting Pen to Paper – NMITD Industrial Visit 2018 to Navneet Education Ltd.
DES’s Navinchandra Mehta Institute of Technology and Development, had organized a one day Industrial Visit to Navneet Education Ltd, Village Khaniwade, District, Vasai on Friday, 5th October 2018. Navneet Education Limited is an educational syllabus based content provider in print & digital medium, manufacturer of scholastic paper stationery, publisher of general & children books and also has a wide range of scholastic non-paper stationery products. Navneet Education Limited is in the business of Educational and children Books Publishing, Scholastic paper stationery and non-paper stationery products. It operates in three segments – Publication, Stationery and Others. Over the decades, Navneet has emerged as the preferred brand for educational products among teachers and students. The immensely popular products like Vikas workbooks, Gala practice books, YuVa full-scapes, are hot favorites amongst the young segment of India. These products are bestsellers not just because of their superior quality but also because of the nostalgic association of 90’s kids. Over 200 students of MMS and MCA along with faculty, were split in different group and were given a tour of the factory and one factory supervisor explained all the different stages of printing and binding. The students were amazed to see the huge machines especially the one which was used in storage. The students saw the different process that the paper went through to finally be bound as a work book/ note book etc. The students were very excited and curious, they asked several questions to their supervisors. The students were then shown short film about the history, evolution of Navneet Education and its new unique product range. Finally the students flocked to buy some of the note book/work book which was exclusively for exports. UNITED WAY MUMBAI along with NMITDians !!! Most of us are armchair environmentalists but NMITD guys are walking their talk! 30 MCA and MMS Students of NMITD along with the Student Council President, Mr. MayurNaik and Student Council Secretary Mr.VighneshKhale and Faculty Member , Dr.AnitaBobade and Prof. PritamWarke went to the Mahim Beach near Hinduja Hospital to work along with United Way Mumbai to volunteer for Mahim Beach Clean Up. Every time they pulled out a deep-seated piece of plastic from the sand, we’re reminded that our efforts – however sincere – are only scratching the surface. Long way to go before we return the beach its natural glory. Keep at it! Most of the students realized that the sea was full of plastic bags and little bottles and were informed by CEO, IS Mr. IndranilSengupta that this could be recycled if they as consumers stack it and give it to the “radiwalla” for recycling. 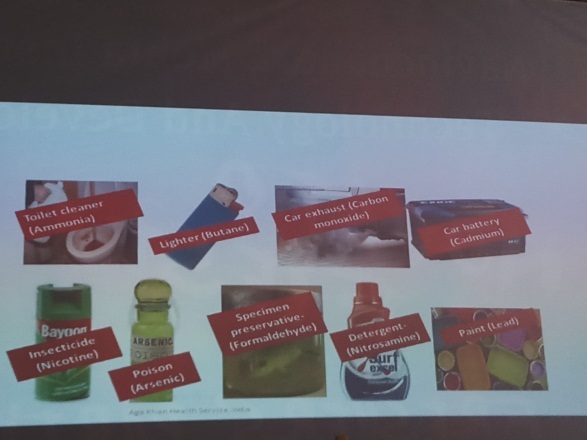 Students realized that most of the things which they use can be disposed of sensibly. A great learning experience! 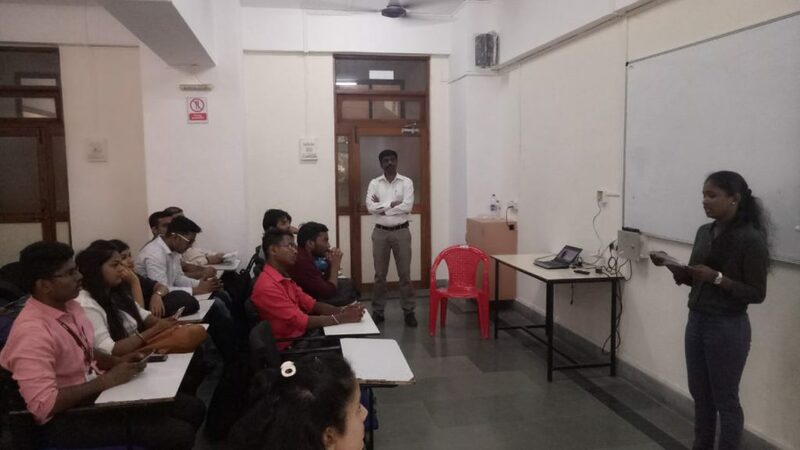 The Institute organized a session on Thoughts on Mahatma Gandhi in March 2018. The session continued for 2 hours. 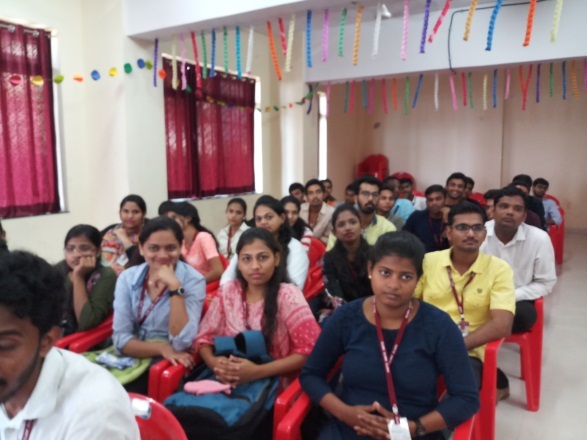 Around 80 students and 15 faculty members attended this programme. 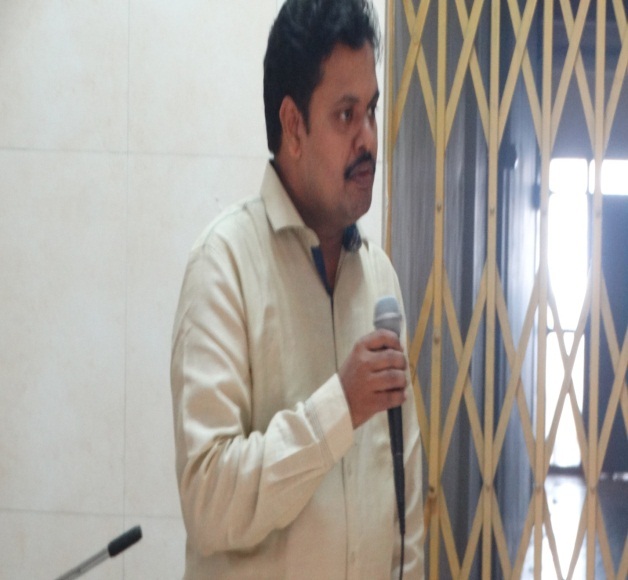 The session was delivered by Mr. Saurabh Surve. The guest explained the different thoughts of Mahatma Gandhi which was very useful in our day to day activities. The guest also explained the different thoughts of Mahatma Gandhi such as Change and service, Religion, God and Spirituality etc. and its implications today. Deccan Education Society have launched a “Chinni Kum” awareness week to promote an awareness regarding Chinese Products proliferation in Indian Markets amongst youngsters. Total 11 faculties and 45 students participated in the same. 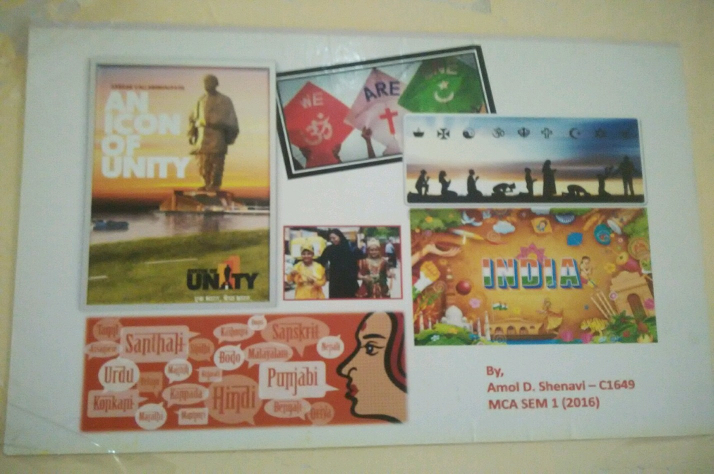 As a part of that programme, MCA students made a documentary, “Made in India”. Indians have the capabilities and the expertise to make world class products and services and the film motivated the youths to buy and promote “Made in India “products. An engaging and creative film was made on this theme by MCA students, Pushpak Bhoir, Ameya PrabhuAjgaokar, Akshay Parab and Jeetendra Vadhwana under the guidance of Prof. Apeksha Khopkar. This film was screened in various colleges across Mumbai and was well received. It is also uploaded on YouTube and NMITD FB. Many Debates and Elocution competition were held. NMITD, had arranged a group discussion for the students of MMS and MCA. There were 9 MCA/MMS students who participated in the discussion, which went on for around 15 minutes. The group discussion had a comprehensive approach about India and China. The major points of discussion included the development history of both the countries, Economy, Budget, Laws, Inflation etc. The students emphasized our Honorary Prime Minister, Shri NarendraModi’s vision of India having an influential role in the global affairs of the near future. Inspite of both the countries being large democracies, India provides lucrative opportunities and growth environment across 25 sectors. 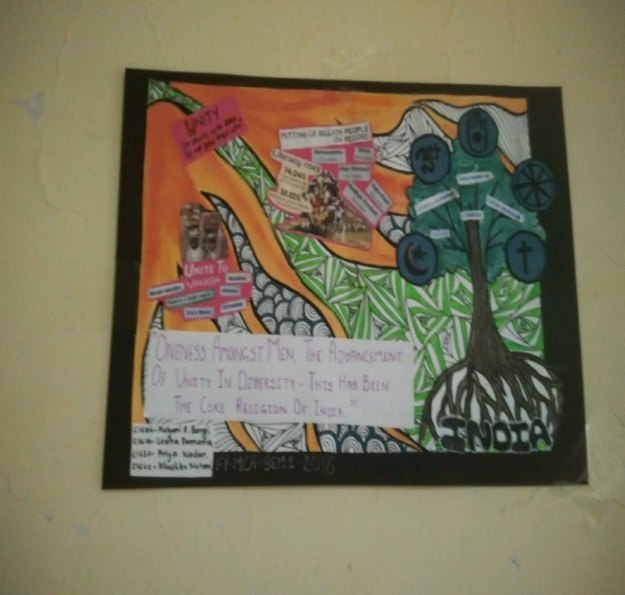 Finally the students concluded that India will definitely be a power to reckon with by 2025 especially true with India being a major hub in I.T and Media. Thus India can surely be seen as an emerging superpower by vision 2020. MMS Students had made a 3 minute Street Play on the same theme. This was scripted by our Library Attendant Mr.Arjun Chavan and Directed by Dr.Anita Bobade. Following students along with other MMS/MCA students promoted this street play in colleges of Mumbai. Session on Right to Information Act, 2005. 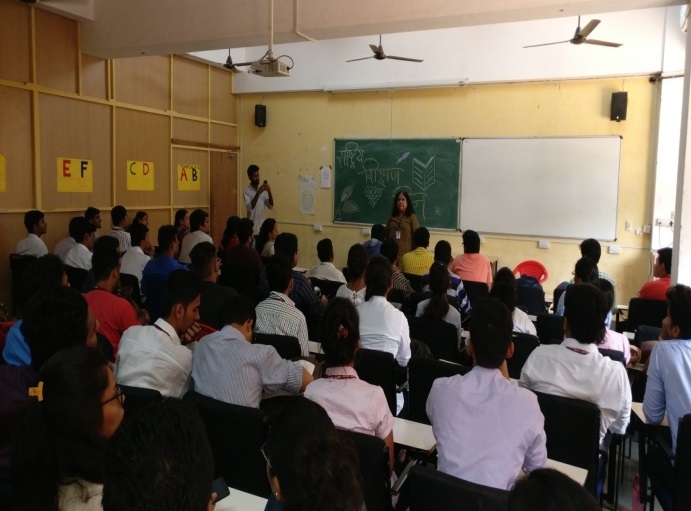 The students were enlightened by a session on the Right to Information Act, 2005 by Mrs.Aditi Sawant. The students were educated on the scope, purview and the implications of the Act. The speaker spoke about the rights of Indian citizens under the Act. 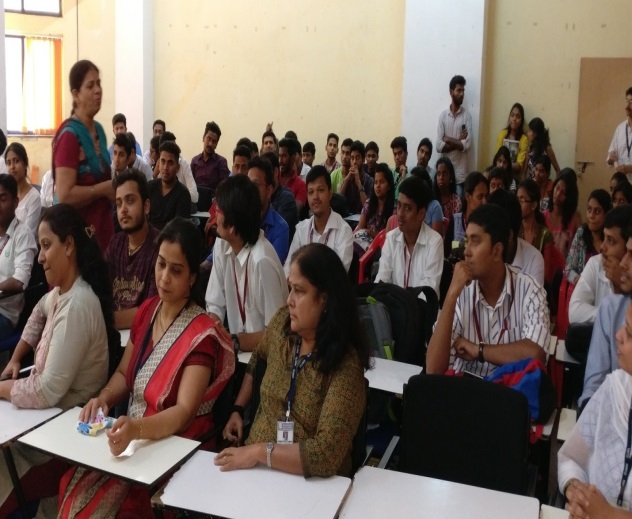 The said session was conducted on 8th Feb 2016 and was attended by 145 students. 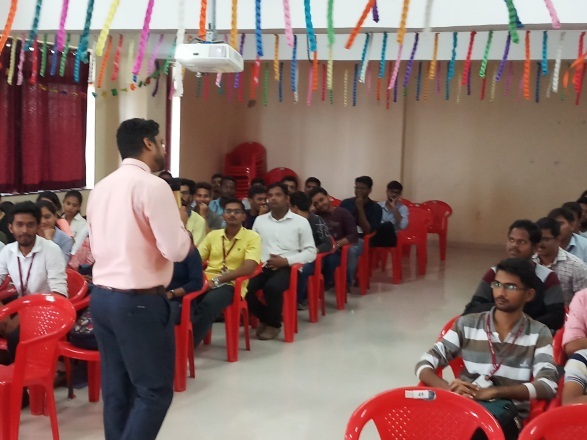 The Institute organized a session by Mumbai Grahak Panchayat for students on Consumer Awareness. 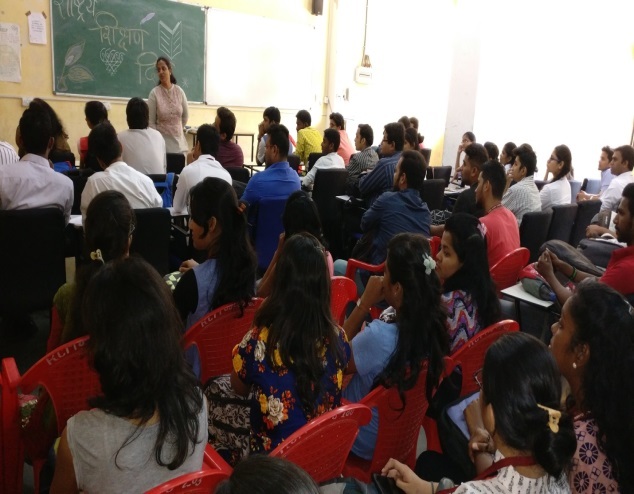 The session was conducted by resource persons of Mumbai Grahak Panchayat (Bandra Division) for students of NMITD on 12th September 2016. It highlighted the often ignored rules and rights of the consumers as well as the products purchased from e-commerce portals. Total 12 faculties and 77 students attended the same. The Institute organized the Group Discussion on National Integration in April 2015. The programme continued for 2 hours. Around 65 students and 13 faculty members attended this programme. The Group discussion was conducted by the HR faculties Prof. Renuka Savant and Prof. Kasturi Naik. The guest explained that National integration refers to the unity and integrity of the nation. 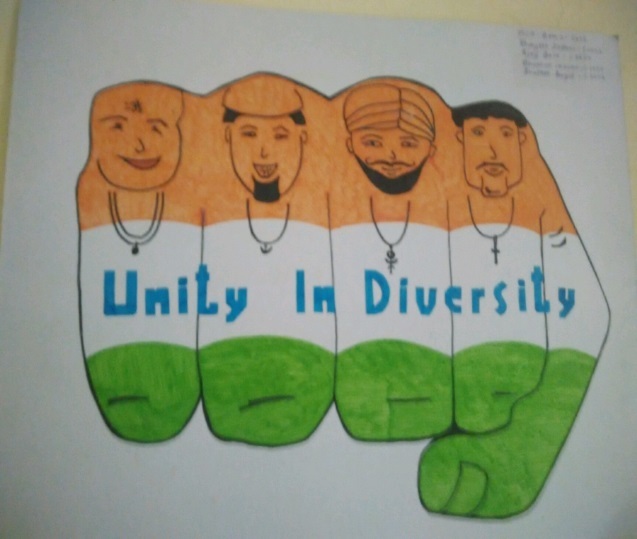 India is a country of splendid diversity yet representing unity. There is diversity in the culture, traditions, customs and languages of the people, but we are all united as Indians. National integration brings all the people together in peace and harmony. A nation’s growth and development depends on its unity and integrity. The institute organized the lecture on Abhinav Bharat in January 2014. The programme continued for 2 hours. 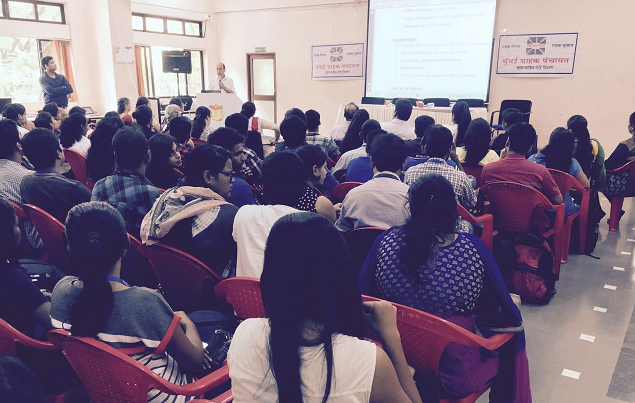 Around 110 students and 12 faculty members attended this programme. The lectured was delivered by honourable Dr. Pankaj Phadnis. 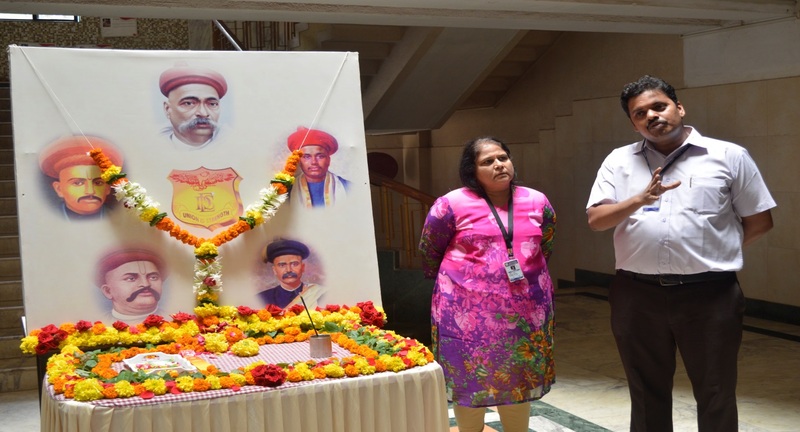 The guest explained that Abhinav Bharat was founded by Veer Savarkar in 1904 to fight against British empire. 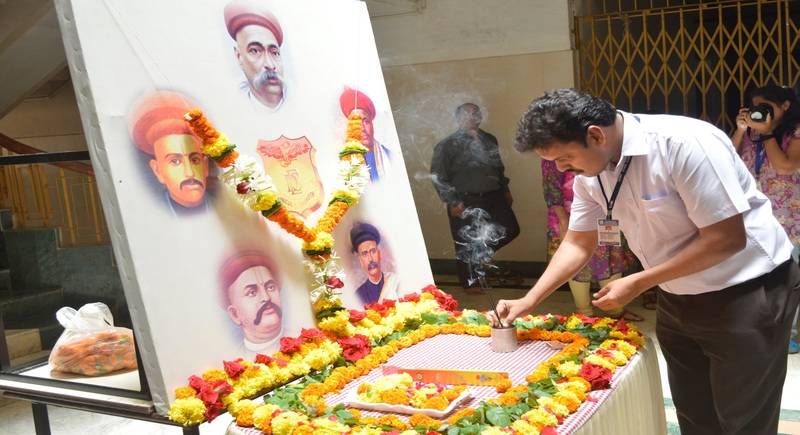 He further added that Vinayak Savarkar and Ganesh Savarkar started Mitra Mela, a revolutionary secret society in Nasik in 1899. It was one among several such melas (revolutionary societies) functioning in Maharashtra at that time, which believed in the overthrow of British rule through armed rebellion. In 1904, in a meeting attended by 200 members from various towns in Maharashtra, Vinayak Savarkar renamed it Abhinav Bharat. 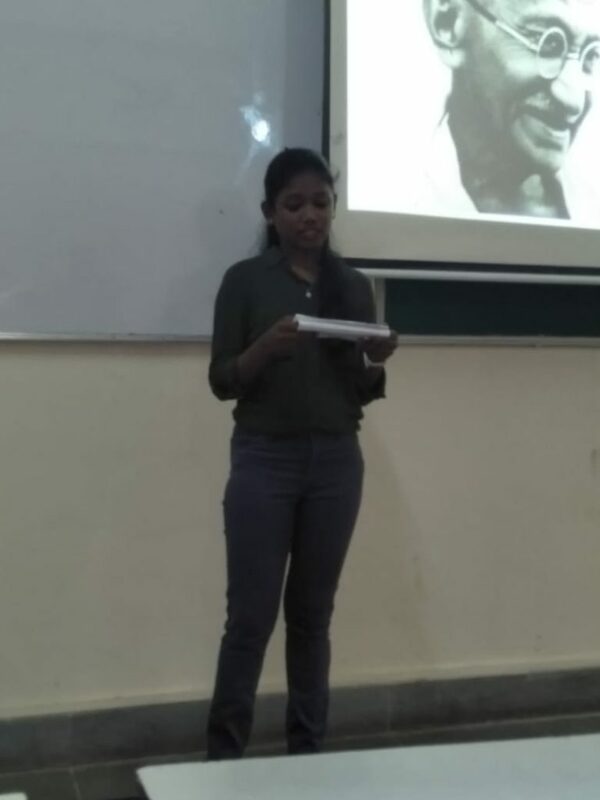 NMITD observed the 149th birth anniversary of Mahatma Gandhi on 2nd of October 2018.To mark the occasion the students of MMS 1st year organized a short program in the presence of professors and other MCA/MMS students, wherein the studentYogitaaddressed the crowd with her small and succinct speech. She recollected in brief the political career and life trajectory of Mahatma Gandhi beginning in South Africa with the fight for civil rights of Indian citizens residing in South Africa and then took further shape in Indian freedom struggle where he played a pivotal role in mobilizinga mass movement against British colonialism by inventively applying his methodology of Non-violent Satyagraha and peaceful non-cooperation against the exploitations by British Raj. A small discussion took place during which other faculty members and some students shared their thoughts on the ever increasing relevance of Gandhi in today’s turbulent times, mired as it is with the rising menace of global terrorism and also the tendency to respond to it with self-aggrandizing militaristic nationalism. On this occasion we all remembered this great son of India who was shot dead on January 30, 1948, but who still is alive and will remain so in foreseeable future in the hearts and souls of not only Indians but the World at large. This occasion also marks the 114th birth anniversary of Shri LalBahadur Shastri, the 2nd Prime Minister of India. 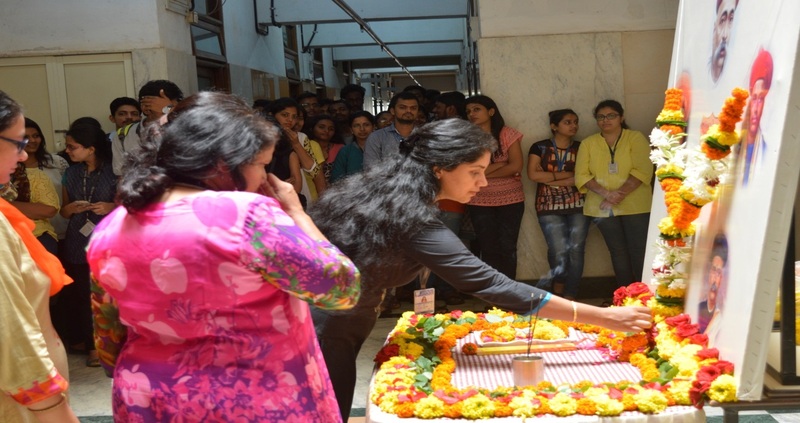 NMITD’s students and staff paid their homage to him as well remembering his slogan of “Jai Jawan, Jai Kisan” and his role in uplifting the agricultural sector in post-independence India. 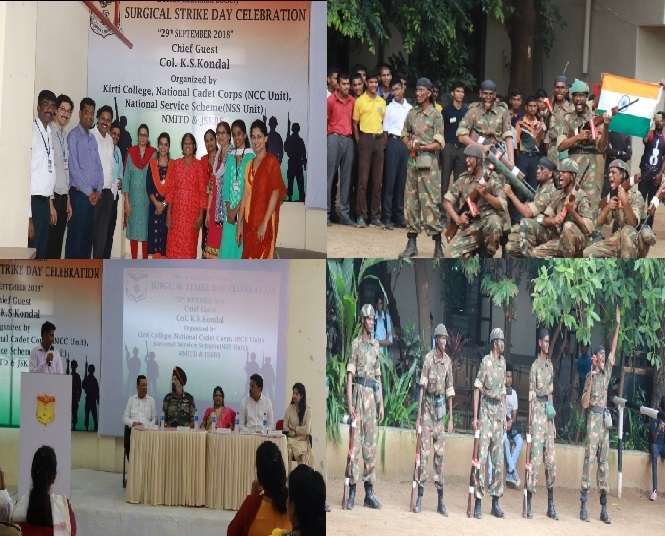 Deccan Education Society Mumbai Campus Celebrated the “ ParakramParva” – The Second Anniversary of “ Surgical Strikes” carried by the Indian Army across the Line of Control, on Saturday 29th September 2018. Chief Guest Col K S Kondal was given a welcome by NCC students by a March Past at the ground of Kirti College. He saw the Poster Exhibition made by the students and then came to the Hall for addressing the students.Col K S Kondal made a brief presentation on the Surgical Strikes that was carried out on September 29, 2016 by the Indian Army was a historic move, which resulted in the death of 38 terrorist. It was indeed a brave move where there was no casualty on the Indian side. He congratulated the brave soldiers fighting to maintain the sovereignty and integrity of the nation. “They personify courage and heroism. The nation salutes them,” he said. He expressed the hope that the long-festering Kashmir tangle would be resolved soon. Col K S Kondal address was interesting, engaging and energetic. He urged the common people to stand solidly behind the armed forces to further raise their morale and the will to fight the enemies of the nation and protect its geographical sovereignty; he said that this is what is now needed. Col. Kondal also answered many questions raised by the faculty and the students of Navinchandra Mehta Institute of Technology and Development, Jayashree Kothari Business School and NCC cadets of Kirti College. He also gave a brief explanation of the uniform worn by the officers of the Armed Forces and how Army had empowered his life. After this, on the grounds of Kirti College there was a Bunker Busting Drill and a “ Surgical Strikes” demonstration by the NCC cadets of Kirti College. After this demonstration, Retd Major Dr.Bohara motivated the NCC cadet, students to be of service to the Nation. He was immensely impressed by their drill. Prof. NandakumarBorahde did a great job as a compere. Dr.SeemaSaple, Principal, Kirti College, Dr.SamadhanKhamkar, Director, NMITD, Dr.ShrutiManatri, Director, JSKBS Dr.CharulataKulkarni, Vice Principal,and Life Member, Dr.D V Pawar and Dr.SeemaPurohit along with NCC Cadets and students of NMITD, JSKBS were present to celebrate the occasion. We at NMITD observed National Education Day (Rashtriya Shikshan Divas) on the occasion of the birth anniversary of late Maulana Abdul Kalam Azad, freedom fighter and one of the founding fathers of independent India. On this occasion Prof. Anita Bobade of MMS addressed students emphasizing the crucial role played by Maulana Abdul Kalam Azad as an educationist. 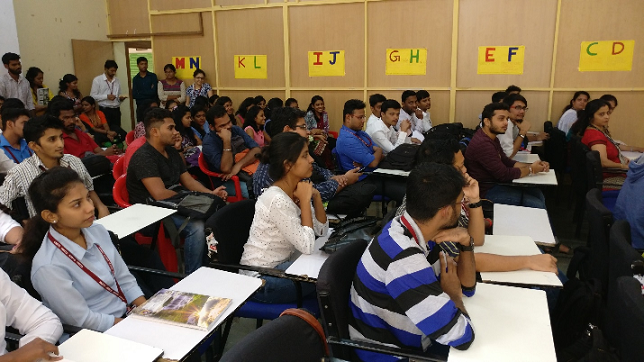 Head Librarian Ms. ShamalaMajumdar initiated a discussion with students provoking them by raising important questions regarding the difference between education and merely job-oriented training. Prof. Ms. PrachiKulkarni of MMS extended the discussion started by Ms. ShamalaMajumdar illustrating the distinction by means of intuitive examples. Students gave a very good response by attending in good numbers on the occasion. They found that the discussions and lectures were truly fruitful in reinforcing the importance, the respective values and the role of education in them, particularly useful in the knowledge economy of the current 21st century. 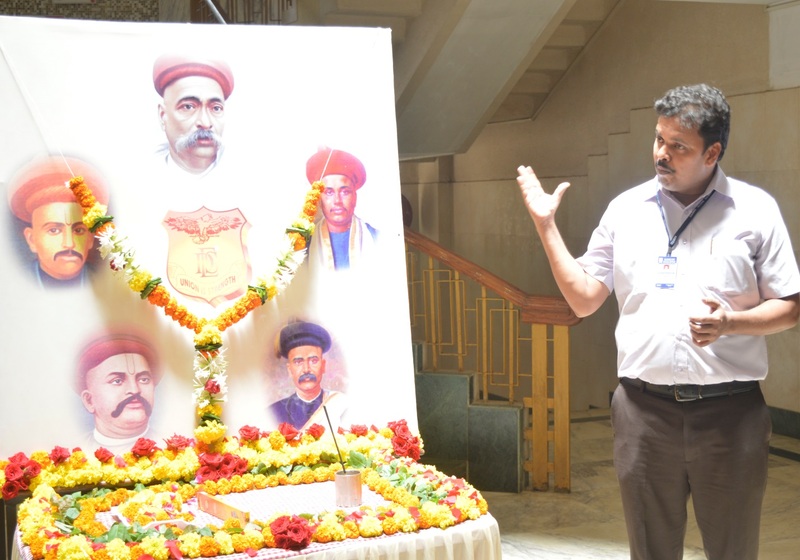 The third RashtriyaEkta Divas (National Unity Day) was observed at NMITD on the occasion of the birth anniversary of SardarVallabhai Patel, the great freedom fighter and one who was called the Iron Man of India. SardarVallabhai Patel as we know was one of the greatest freedom fighters and the one who is considered as instrumental in keeping India united. 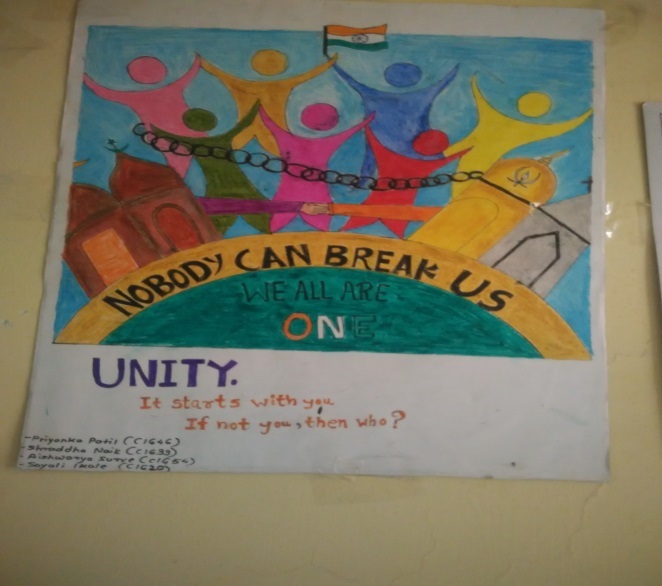 On this occasion the students of MCA at NMITD conducted drawing and painting activities under the theme of National Integrity. Lots of students participated in this activity with lots of diverse and interesting/insightful sketches, paintings and drawings produced by many. The theme truly brought out the cohesive unity amidst multicultural diversity that marks the true spirit of India. On 26th January every year Republic day is celebrated with the Director hoisting the flag and reciting the National Anthem. The students are enlightened about the freedom struggle and homage is paid to our freedom fighters. Students are encouraged to speak about National integrity, patriotism and Unity. On 15th August every year Independence day is celebrated with the Director hoisting the flag and reciting the National Anthem. The students are enlightened about the freedom struggle and homage is paid to our freedom fighters. Students are encouraged to speak about National integrity, patriotism and Unity. Deccan Education Society, a star in the galaxy of educational institutes, has a 132 glorious years legacy imparting value based education for masses. It is celebrated on 9th August, every year to pay respects to the illustrious founders,– LokmanyaBalGangadharTiak, Professor VamanShivramApte,Gopal Ganesh Agarkar,VishnushastriChiplunkar and MahadeoBallalNamjoshi. Homage is given to our founding fathers, and the students are reminded about the contribution of the founders. 9th August is a day, when Principal VamanShivramApte, the first Principal of the Fergusson College, Pune and also the secretary of DES, passed away . In honour of his contribution, the Deccan Education Society has been observing the day (9th August) as Founders Day. DES has a glorious tradition of starting an Indian Education Institute during the “British Raj”. He also spoke about the evolution of DES, and the 45 Institutes it has under its ambit and the illustrious alumni. 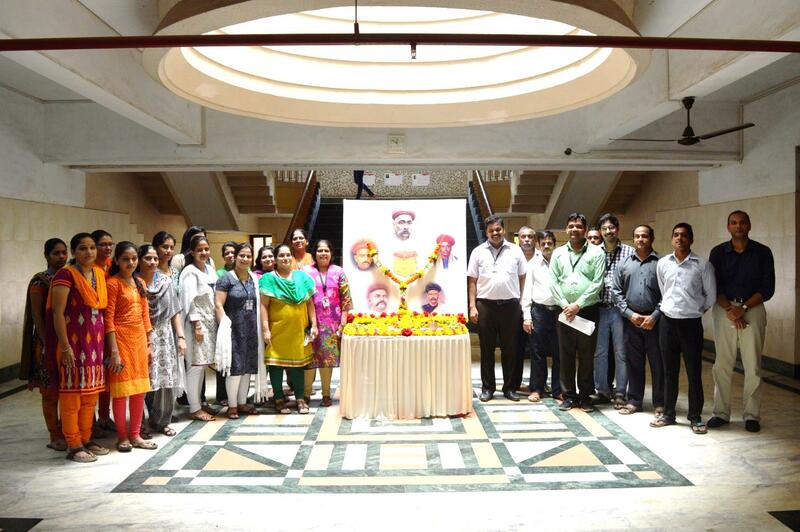 All the teaching, non teaching staff and students pay floral tributes to the founding fathers. 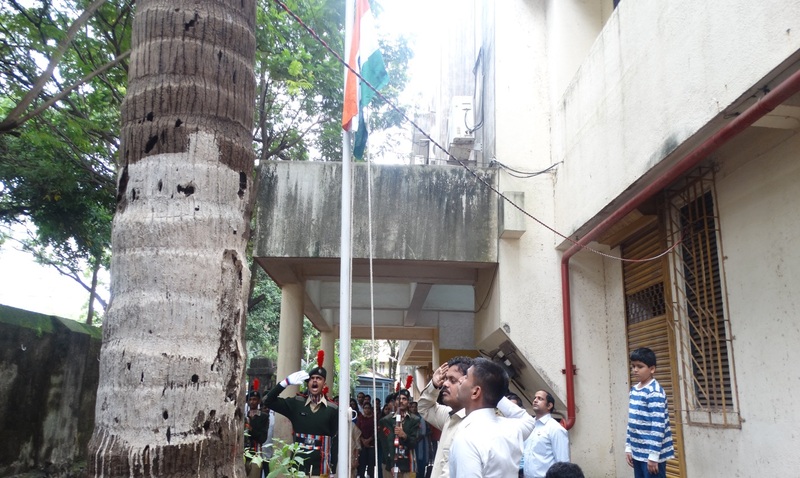 On 15th August, 2015, the 70th Independence day, The Director, Dr.Seema Purohit, hoisted the flag. In her address, she mentioned about the freedom struggle and paid homage to our freedom fighters. Dr.Anita Bobade, recited the poem of Gurudev Tagore, “ Where the Mind is Without Fear” and spoke about how young and vibrant India would be soon a super power globally by 2025. Ms. Steffi D’silva, MCA, Second Year Students, enlightened her friends about the significance and importance of our national anthem. 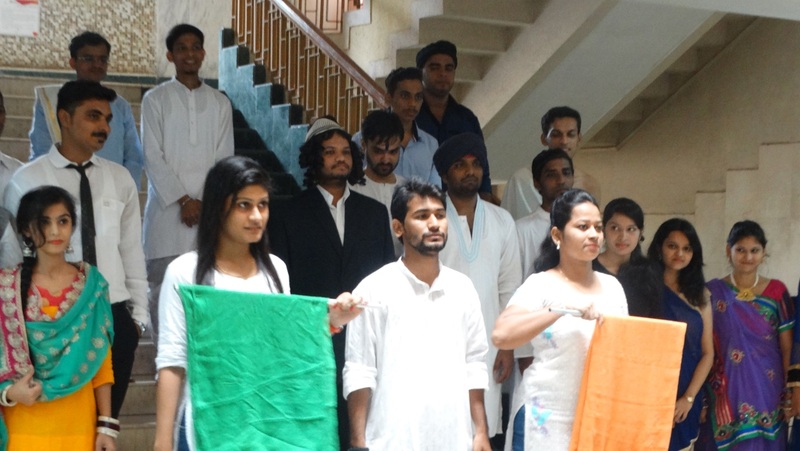 Thereafter patriotic songs were sung by MCA student Mr. Saurabh Markal and Group. This was followed by a Fashion Show Jai Ho…whose theme was “Religious Unity in India”. The audience was enthralled by superb compering by Ms. Divya Salian.